In the summer of Richard Rodgers Centennial, his music was celebrated in grand style from music sheds to bandshells, from the Hollywood Bowl to Royal Albert Hall. On the Fourth of July, hundreds of pops concerts nationwide paid tribute to Rodgers; channel-surfers watching network coverage of that evenings festivities would have heard Rodgers music on NBC (as part of the Macys Fireworks Spectacular) and on ABC (Peter Jennings special on American music) as well as performed by Keith Lockhart and the Boston Pops on the banks of the Charles River (POPS GOES THE FOURTH! on A&E), and Erich Kunzel and the National Symphony Orchestra on the West Lawn of the U.S. Capitol (A CAPITOL FOURTH on PBS). Websters Second Edition defines ""concert"" as follows: ""loosely, any public musical performance at which various individual compositions are rendered, as opposed to the performance of a single work such as an opera."" That was in 1941; for a complete modern definition, especially as it relates to the Richard Rodgers Centennial, we have to hang somewhat on that ""loosely,"" since in addition to the variety of pieces making up an evenings presentation, a single work performed ""in concert"" has become fashionable. Both individual shows and potpourris were in evidence this year, largely inspired by the notion of joining in the Centennial Celebrations. A week did not go by this summer without our hearing about tributes paid at concerts large and small -and around the world. Our Centennial Website listed those events we knew about, but we know there were hundreds of others we hadnt been aware of. Friends going back home to visit parents reported on band concerts in town greens and gazebos; we also heard about school salutes by marching bands and even impromptu sing-alongs. Many of our most loyal collaborators in the concert field used this year as an inspiration for some creative programming. John Mauceri, long a champion of Rodgers music and a programming maverick in his position as the conductor of the Hollywood Bowl Orchestra, chose to focus two evenings on RODGERS & HAMMERSTEIN AT THE MOVIES. Leaning on the neighborhoods main industry, he showed clips from many of the great Hollywood versions of the R&H shows while playing the orchestral accompaniment live. Earlier in the summer he made his Chicago Symphony debut in a rousing Rodgers tribute at the Ravinia Festival with a panoply of artists ranging from John Raitt to Sylvia McNair. Erich Kunzel, another loyal investigator of the Rodgers canon, included rarities like the 1937 oratorio ""All Points West"" in several of his concerts. Knowing that much of his audience wants those well known Rodgers and Hammerstein songs, they were there, but after some diversions. His Capitol Fourth concert broadcast live from Washington also included a dance interpretation to ""The Carousel Waltz."" Keith Lockhart, along with Maureen McGovern, led The Boston Pops in a Rodgers tribute -complete with sing along - as part of their July 4th outdoor concert on the Esplanade overlooking the Charles River. His rousing Springtime Rodgers evenings at the Pops were made into two PBS programs that were shown throughout the summer. As for musicals in concert, there were several this year, including A CONNECTICUT YANKEE done with full orchestra by 42nd Street Moon in San Francisco, but in an event status of their own were concert performances on both sides of the Atlantic of Rodgers personal favorite: CAROUSEL. The first CAROUSEL concert, on June 6, provided New York with an all-star, one night sellout at Carnegie Hall, where Hugh Jackman made his New York debut as Billy Bigelow playing opposite Audra McDonald as Julie. Leonard Slatkin conducted the Orchestra of St. Lukes, with direction by Walter Bobbie and a script adapted by Bobbie and John Weidman. Judy Kaye was Nettie Fowler, Lauren Ward and Jason Danieley played Carrie and Enoch Snow, and Norbert Leo Butz was Jigger. (Blythe Danner and Philip Bosco played the non-singing roles of Mrs. Mullin and the Starkeeper, respectively.) A special guest spot was reserved for John Raitt - whose first appearance following ""The Carousel Waltz"" brought the audience to its feet. The glorious original dance music, so often cut or changed in production, was presented in its entirety. A week later, London presented CAROUSEL at Royal Festival Hall, conducted by David Charles Abell with the BBC Orchestra and an international cast including an American, Emily Loesser, as Julie and an Australian, Spencer MacLaren, as Billy. It was equally thrilling, and London was so enamored of the idea of Rodgers in concert that one of the August Proms at Royal Albert Hall was devoted to OKLAHOMA!, centered around the irrepressible performance of Aunt Eller by Maureen Lipman, who starred in the recent Royal National Theatreproduction. Using a script prepared by William Hammerstein for a 25th Anniversary concert at the New York Philharmonic in 1968, this presentation was conducted by David Charles Abell and directed by Kenneth Richardson. Joining Lipman were Brent Barrett as Curly, Lisa Vroman as Laurey and Klea Blackhurst as Ado Annie. We have no way of knowing when the first composition by Richard Rodgers made its way to a concert hall. We do know that he conducted concerts himself at Lewisohn Stadium in upper Manhattan starting in 1948, and we know that classic concert arrangements were prepared by Robert Russell Bennett and others through the years. But with the increasing interest in doing musicals ""in concert,"" the exploration of what suits the material best continues. Webster certainly hit on the most commonly thought of definition of ""concert,"" but with the success of the Encores! 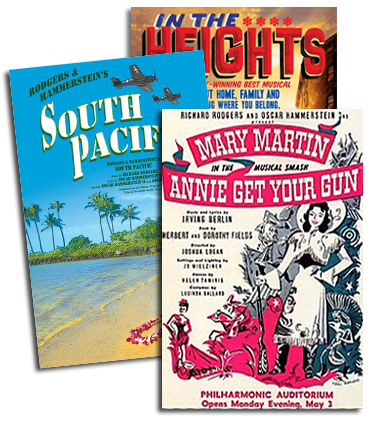 series in New York, and the various other ""musicals in concert"" series around the world, we are clearly in a period where musicals have made their way into the concert hall. Maybe in its new edition, Websters will have to amend the definition of ""concert"" by adding ""...or the presentation of an entire work provided both the music and the drama are honored."" That would bring things up to date.